As you might gather from this quote, this book is not just about Batman’s treaty. In fact, looking at the book lying on my desk here with “Possession” in large silver letters on the spine, I’m not really sure that the book is about possession at all. The treaty itself could be a construction, and whatever ‘truth’ there is about it has been overlaid by boosterism, intentional forgetting and spin. 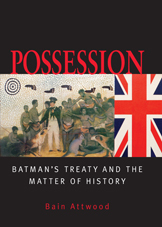 The treaty document itself was drawn up in Van Diemen’s Land before Batman arrived in Port Phillip; the ‘signatures’ have a suspicious similarity, and Batman did not, as he claimed, walk the boundaries of the land ‘traded’. 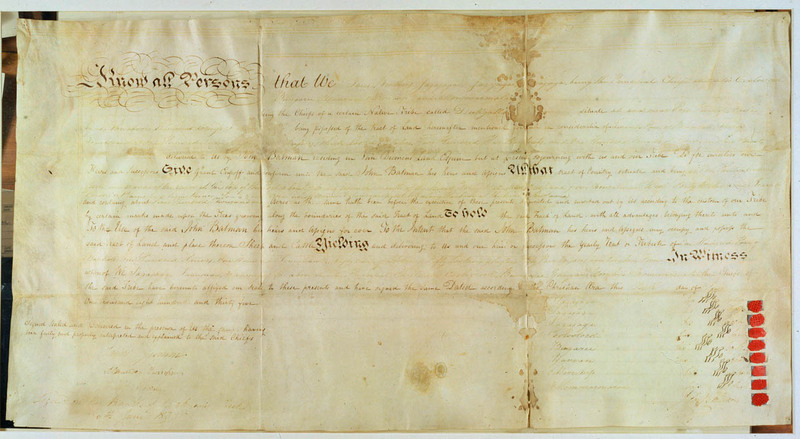 The motivations for the treaty and its subsequent quashing by the NSW goverment, as Attwood explores, are best explained in terms of the time in which it was put forward – 1835- in the wake of the Black Wars in Tasmania, under the influence of the humanitarian lobbyists in London, and in light of the invention through the NSW courts during the 1830s and 1840s of a spurious ‘authorized’ history of British sovereignty in New South Wales, some 50 years after the event. The creation and rejection of the treaty takes up only the first 100 pages of the book. It then meanders into an exploration of the artistic depiction of the treaty over time and the change in emphasis on Batman’s treaty to Batman’s purported (and spurious) sailing up the river and declaration “This will be the place for a village!”. I found the artwork fascinating. Some time ago I had pooh-poohed the grand, commemorative American artwork tradition but here it is, alive and well in Melbourne- see here – it’s just not displayed in our art galleries any more. The book moves into a discussion of history-writing in Victoria, with a string of antiquarian historians burnishing the Batman legend and feeding the Victorian (in both senses of the word) obsession with memorials and commemorations. There was the Batman memorial over his putative grave; a memorial stone embedded in the footpath, Batman Park, Batman Avenue. Then gradually the cracks in the image started appearing with questions over Batman’s parentage and sobriety and the championing of Fawkner’s settler history as an alternative story, pushed along by the tourism industry and latter-day Melbourne boosters and P.R. agents. Gradually the memorials were shifted to quieter, less prominent locations, parks were renamed, and explanatory plaques were attached to statues qualifying some of the more gushing tributes to Batman and his activities. Just to add another layer to this already contorted history, it was Aboriginal people in Victoria who maintained the memory of Batman as the white man who dealt fairly with them, at a time when white history had consigned his treaty to the status of a curiosity. The turn to politics becomes more weighty when Attwood takes on Henry Reynolds’ book The Law of the Land , which Attwood argues was a juridical history, intended to present sovereignty as a legal problem for 20th century political purposes and one that, oddly, disregarded the Batman treaty entirely in the original edition of Reynolds’ book. This is a richly illustrated book with coloured reproductions of the grand celebratory paintings, photographs of top-hatted men at yet another Batman memorial unveiling, reproductions of the string of illustrated histories that were published over the years and recent colour photographs of the now-discredited old memorials and their newly-minted replacements. It’s a book that takes us far beyond the treaty. This entry was posted in Aborigines in Port Phillip, Book reviews, Melbourne history, Port Phillip history. Bookmark the permalink. I don’t know how much local history is taught to school children now. Little or nowt I would guess. But these myths which have been debunked really need to be on the record.